Last Friday, I had the pleasure of attending a Creative Mornings talk by Mike Maydak. Though best known for his comic- and pop culture-based fan art paintings and giclée prints, Maydak also occasionally focuses his vivid, twisty aesthetic on Cincinnati-area scenes, which I’ll show you here. 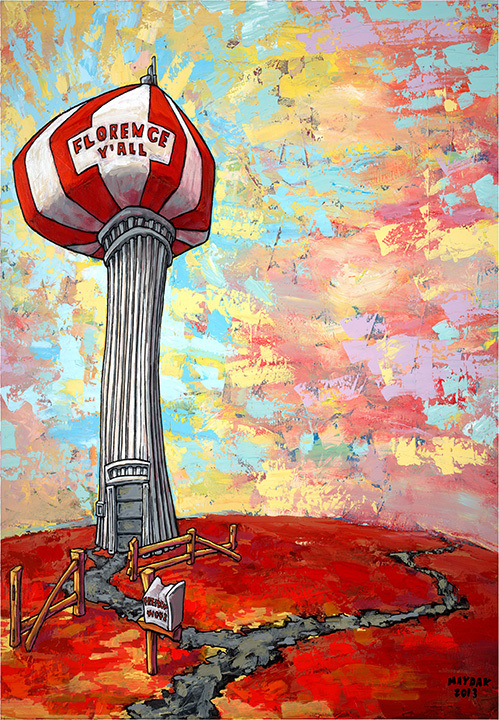 Above is the ubiquitous Florence Y’All water tower in Northern Kentucky. On the Riverfront: The Urbanophile takes a look at Cincinnati, Pittsburgh, Louisville, and St. Louis. Dead/Abandoned Malls – Cincinnati Mills: a video tour through an empty mall. Finding Frank Lloyd Wright in Alabama: touring an architectural gem in the town of Florence, AL. Park Slope Family Circus: cracks me up every time I check it out. 10 Most Beautiful City Parks in the US: just that. Paper Donut’s Optical Illusions: really cool painted installations, reminiscent of the work of Felice Varini. Code Name: Presidential Indiscretion: Cincinnati’s own BombShells celebrated Yarn Bomb Day with some fun in Piatt Park downtown. The History of 1220 Vine Street: Digging Cincinnati History explores an Over-the-Rhine building. Charley Harper: June 25-September 11, 2011: the exhibit opens this weekend at Der Kunstverein in Hamburg. One Night | One Craft: at the Contemporary Arts Center, DIY sessions for grown-ups every Monday night. Check us out on 18 Jul! Urban Camping: Staten Island: as always, Nathan Kensinger shares some fascinating photos. Let Your Garden Grow: 7th House on the Left likes our seed bombs! Last Week for the BOGO Print Promotion! Just a reminder that you have one week left to take advantage of the Bike Month BOGO promotion in our online shop — with any print purchase, we’ll send you one of our penny farthing prints, printed on funky test prints and errors from past projects. Buy two prints, get two bike prints. Buy a bike print, and we’ll send you a second one! Bike Month Promotion: Buy a Print, Get a Bike Print! May is Bike Month and, to celebrate, we’re kicking off a month-long promotion in our online shop — with any print purchase, we’ll send you one of our penny farthing prints, printed on funky test prints and errors from past projects. Buy two prints, get two bike prints. Buy a bike print, and we’ll send you a second one! This simple, graphic mural is entitled You Are Here and was painted by Ellie Balk and SONYA [South Of the Navy Yard Artists] on the side of Tillie’s of Brooklyn, a coffee shop in the Fort Greene section of Brooklyn.